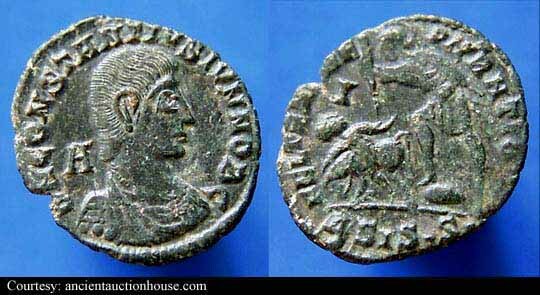 Caesar 351 - 354 Gallus was one of the few who escaped the family massacre initiated by Constantine's sons in order to weed out possible future contestants to the throne. 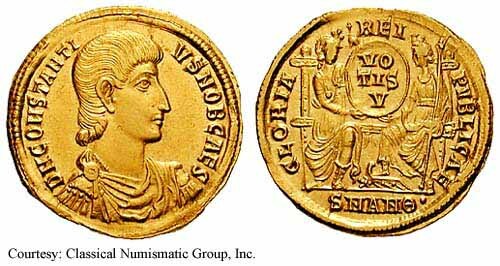 When Constantius II was unable to deal with lesser rebellions out east because more pressing issues required his presence elsewhere, he decided it would be served best if a family member was given the task. So he summoned Gallus, made him Caesar and sent him on his mission. Although he was successful in dealing with the revolts, his methods were found to be so cruel that they would likely spawn new revolts. Word of his heavy-handed manners reached Constantius and he had him recalled. Being led to believe that he was going to be promoted to full Augustus, the happy Gallus arrived at court only to find out he was under arrest. He was then sent to an island, tried and executed. 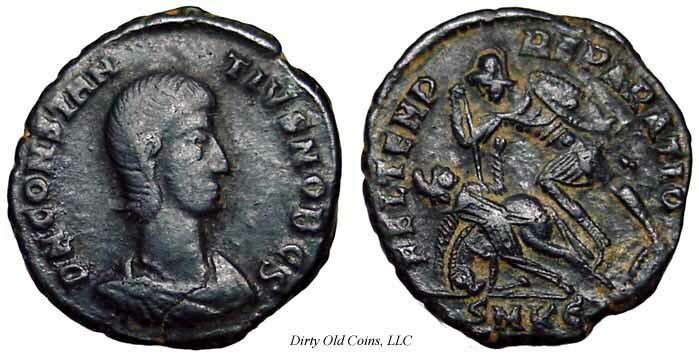 RIC 71a (Antioch) Five Solidi Medallion Obv: DNCONSTANTIVSNOBCAES - Bare-headed, draped and cuirassed bust left. Rev: GLORIAROMANORVM Exe: SMANT - Constantinopolis seated left, stepping on galley prow, holding Victory on globe and scepter. 351 (Antioch). $373,437 12/5/02. RIC 75 (Nicomedia), C 24 Solidus Obv: DNFLCLCONSTANTIVSNOBCAES - Bare-headed, draped and cuirassed bust right. 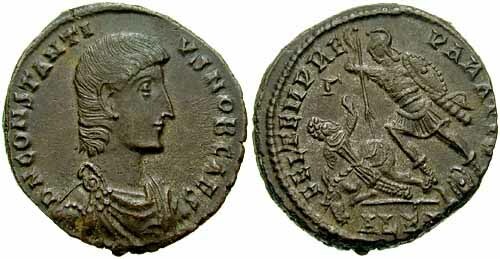 Rev: GLORIAREIPVBLICAE Exe: SMN - Roma, holding scepter, seated facing and Constantinopolis, stepping on galley prow and holding scepter, seated left, together holding shield reading VO/TIS/V. c.351-353 (Nicomedia). 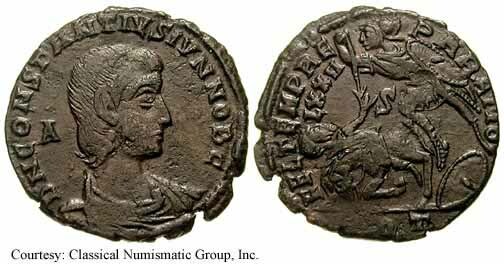 RIC 90 (Antioch), Depeyrot 7/4 Solidus Obv: DNCONSTANTIVSNOBCAES - Bare-headed, draped and cuirassed bust right. 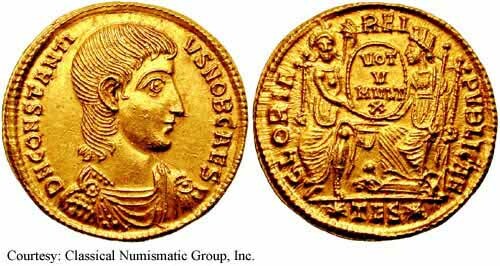 Rev: GLORIAREIPVBLICAE Exe: SMAN вЂў - Roma, holding scepter, seated facing and Constantinopolis, stepping on galley prow and holding scepter, seated left, together holding shield reading VO/TIS/V. 351-354 (Antioch). RIC 149 (Thessalonica), Depeyrot 8/4 Solidus Obv: DNCONSTANTIVSNOBCAES - Bare-headed, draped and cuirassed bust right. 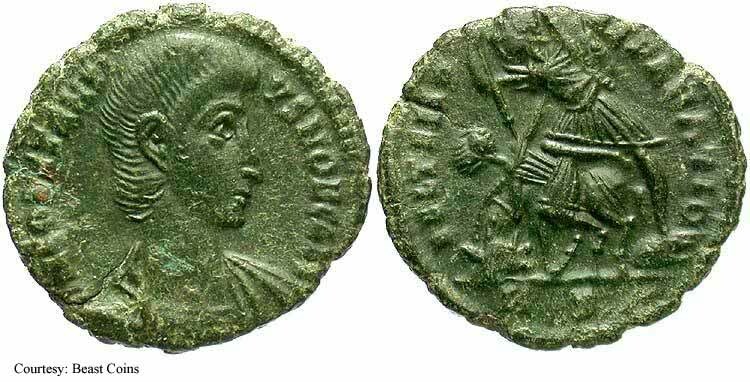 Rev: GLORIAREIPVBLICAE Exe: TES - Roma, holding scepter, seated facing and Constantinopolis, stepping on galley prow and holding scepter, seated left, together holding shield reading VOT/V/MVLT/X. 351-354 (Thessalonica). $5,500 1/13/03. 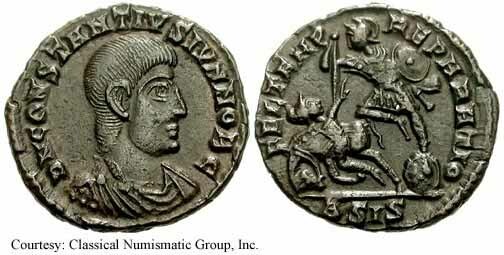 RIC 18 (Sirmium), C 56c Siliqua Obv: DNCONSTANTIVSNOBCAES - Bare head right. Rev: No legend Exe: вЂўSIRM - Wreath, VOTIS/V/MVLTIS/X within. 351-354 (Sirmium). $535 2/4/04. 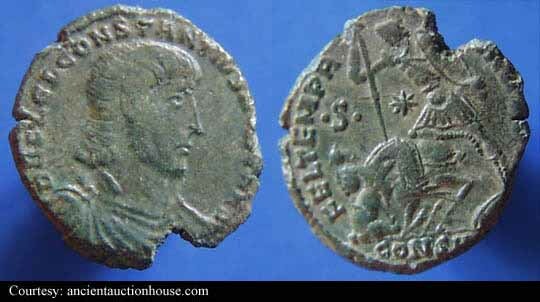 RIC 237 (Constantinople), C 154 Siliqua Obv: DNCONSTANTIVSNOBCAES - Bare head right. Rev: No legend - Wreath, star within. 351-354 (Constantinopolis). 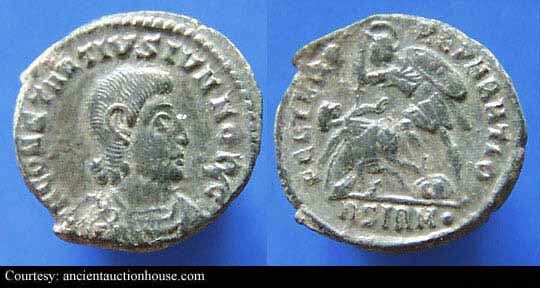 RIC 299 (Siscia) Siliqua Obv: DNCONSTANTIVSIVNNOBC - Bare-headed, draped and cuirassed bust right. Rev: VICTORIACAESARIS Exe: SIS - Victory advancing left, holding palm and trophy. 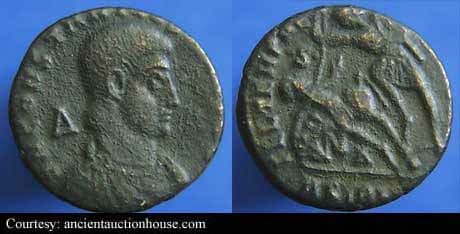 RIC 34 (Sirmium), LRBC 1593 AE2 Obv: DNCONSTANTIVSIVNNOBC - Bare-headed, draped and cuirassed bust right; О” behind bust. 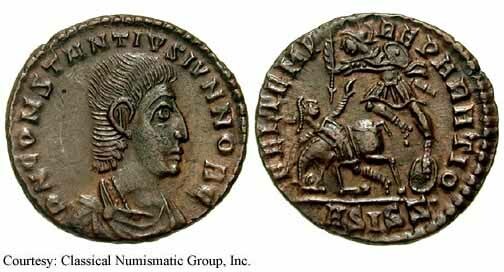 Rev: CONCORDIAMILITVM Exe: SIRM - Constantius Gallus standing, facing, holding labarum in each hand. 351-354 (Sirmium). 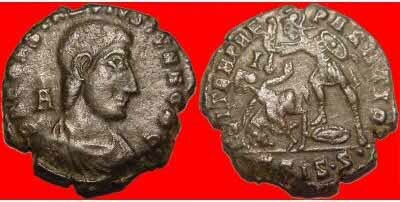 RIC 41 (Sirmium), LRBC 1598 AE2 Obv: DNCONSTANTIVSIVNNOBC - Bare-headed, draped and cuirassed bust right. О” behind bust. Rev: FELTEMPREPARATIO Exe: A/ SIRM - Soldier spearing fallen horseman. 351-354 (Sirmium). 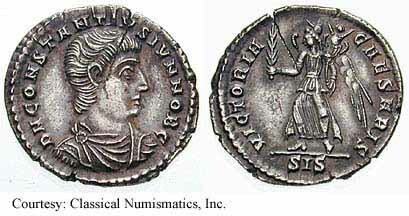 RIC 46 (Sirmium) AE2 Obv: DNCONSTANTIVSIVNNOBC - Bare-headed, draped and cuirassed bust right. О” behind bust. Rev: FELTEMPREPARATIO Exe: вЂўSвЂў/ SIRM - Soldier spearing fallen horseman. 351-354 (Sirmium). $5 10/19/02. 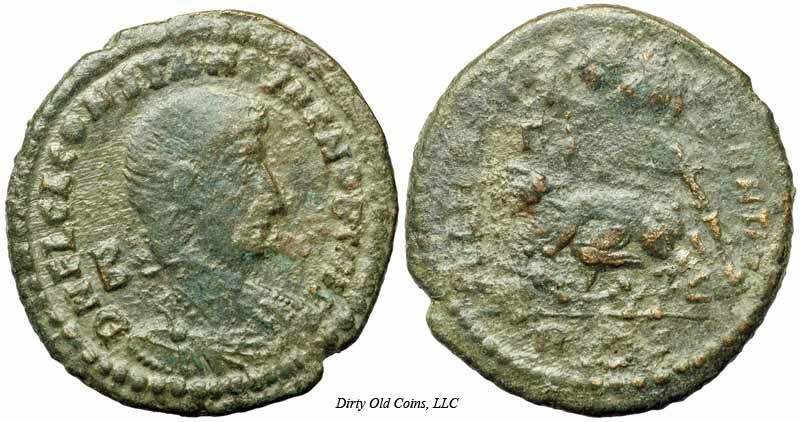 RIC 49 (Sirmium), LRBC 1604 AE2 Obv: DNCONSTANTIVSIVNNOBC - Bare-headed, draped and cuirassed bust right. О” behind bust. Rev: FELTEMPREPARATIO Exe: SIRM - Soldier spearing fallen horseman. 351-354 (Sirmium). RIC 51 (Sirmium), LRBC 1608 AE2 Obv: DNCONSTANTIVSIVNNOBC - Bare-headed, draped and cuirassed bust right. Rev: FELTEMPREPARATIO Exe: EV/ SIRM - Soldier spearing fallen horseman. 351-354 (Sirmium). 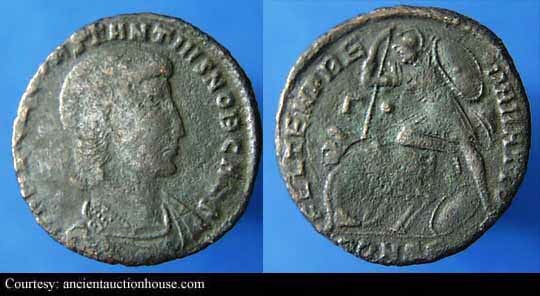 RIC 74 (Alexandria) AE3 Obv: DNCONSTANTIVSNOBCAES - Bare-headed, draped and cuirassed bust right. Rev: FELTEMPREPARATIO Exe: О“/ALE - Soldier spearing fallen horseman. 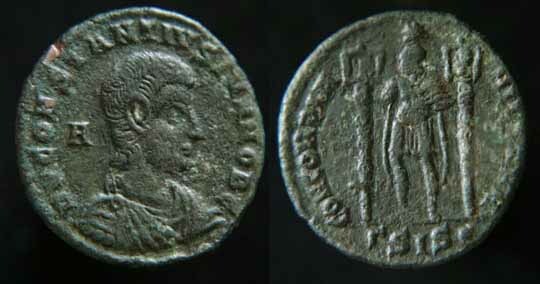 RIC 107 (Constantinople), LRBC 2029 AE2 Obv: DNFLCLCONSTANTIVSNOBCAES - Bare head, draped and cuirassed bust right. Rev: FELTEMPREPARATIO Exe: О“вЂў/CONS - Soldier spearing fallen horseman. 351-354 (Constantinopolis). 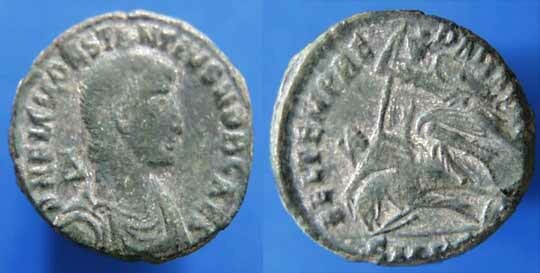 RIC 113 (Constantinople), LRBC 2034 AE2 Obv: DNFLCLCONSTANTIVSNOBCAES - Bare head, draped and cuirassed bust right; О” behind bust. Rev: FELTEMPREPARATIO Exe: BвЂў/CONS - Soldier spearing fallen horseman. 351-354 (Constantinopolis). RIC 120 (Constantinople), LRBC 2040 AE2 Obv: DNFLCLCONSTANTIVSNOBCAES - Bare-headed, draped and cuirassed bust right. Rev: FELTEMPREPARATIO Exe: CONS - Soldier spearing fallen horseman. 351-354 (Constantinopolis). $15 3/29/03. RIC 137 (Antioch) AE2 Obv: DNCONSTANTIVSNOBCAES - Bare-headed, draped and cuirassed bust right. Rev: FELTEMPREPARATIO Exe: О“/AN - Soldier spearing fallen horseman. 351-354 (Antioch). RIC 167 (Thessalonica), LRBC 1667 AE2 Obv: FLIVLCONSTANTIVSNOBCAES - Bare-headed, draped and cuirassed bust right. 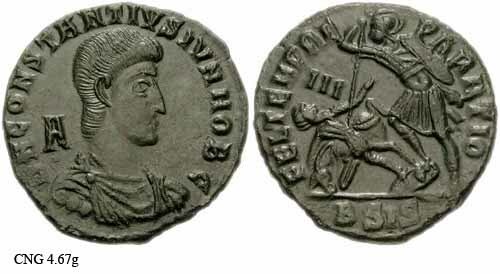 Rev: CONCORDIAMILITVM Exe: О“/ TS - Constantius Gallus standing, facing, holding labarum in each hand. 351-354 (Constantinopolis). $135 8/1/03. RIC 250 (Rome), LRBC 661 AE2 Obv: DNCONSTANTIVSIVNNOBC - Bare-headed, draped and cuirassed bust right; A behind bust. 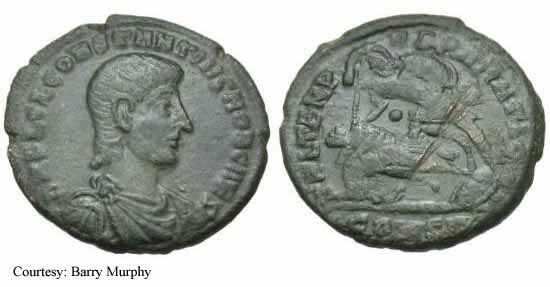 Rev: FELTEMPREPARATIO Exe: III/ /R - Constantius Gallus standing left on galley, holding Victory on globe and labarum; Victory seated to right, steering. 352-354 (Rome). RIC 345 (Siscia), LRBC 1215 AE2 Obv: DNCONSTANTIVSIVNNOBC - Bare-headed, draped and cuirassed bust right; A behind bust. Rev: FELTEMPREPARATIO Exe: II/вЂў SISвЂў - Soldier spearing fallen horseman. 351-354 (Siscia). $3 3/7/04. RIC 347 (Siscia), LRBC 1217 AE2 Obv: DNCONSTANTIVSIVNNOBC - Bare-headed, draped and cuirassed bust right; A behind bust. Rev: FELTEMPREPARATIO Exe: I/ SISвЂўSвЂў - Soldier spearing fallen horseman. 351-354 (Siscia). $3 2/26/04. RIC 24 (Sirmium), C 34 AE3 Obv: DNCONSTANTIVSIVNNOBC - Bare-headed, draped and cuirassed bust right. "A" behind bust. 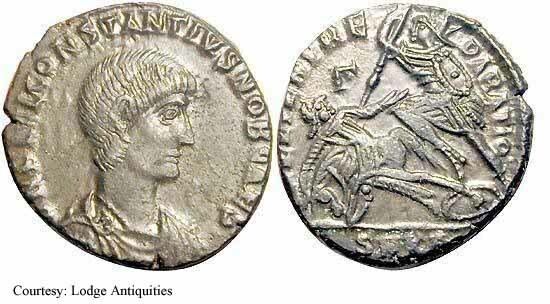 Rev: HOCSIGNOVICTORERIS Exe: III/ SIRM - Constantius Gallus standing left, holding labarum and scepter; Victory standing to right, crowning him and holding palm. 351-354 (Sirmium). 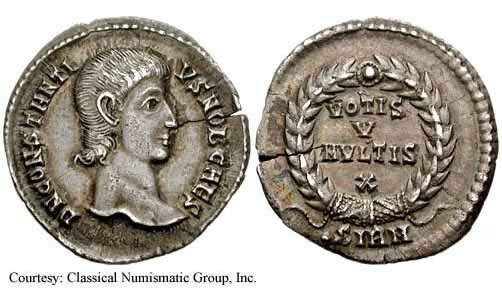 RIC 36 (Sirmium) AE3 Obv: DNCONSTANTIVSIVNNOBC - Bare-headed, draped and cuirassed bust right; вЂњО”вЂќ behind bust. Rev: FELTEMPREPARATIO Exe: SIRM - Soldier spearing falling horseman. RIC 53 (Sirmium), LRBC 1606 AE3 Obv: DNCONSTANTIVSIVNNOBC - Bare-headed, draped and cuirassed bust right. Rev: FELTEMPREPARATIO Exe: SIRMвЂў - Soldier spearing fallen horseman. RIC 84 (Heraclea) AE3 Obv: DNCONSTANTIVSNOBC - Bare-headed, draped and cuirassed bust right. Rev: FELTEMPREPARATIO Exe: SMH - Soldier spearing a falling horseman. RIC 91 (Heraclea) AE3 Obv: DNCONSTANTIVSNOBC - Bare-headed, draped and cuirassed bust right. Rev: FELTEMPREPARATIO Exe: SMH - Soldier spearing falling horseman. 351 (Heraclea). $25 12/22/02. RIC 94 (Cyzicus) AE3 Obv: DNFLCLCONSTANTIVSNOBCAES - Bare-headed, draped and cuirassed bust right. Rev: FELTEMPREPARATIO Exe: О“/SMK - Soldier spearing falling horseman. RIC 99 (Cyzicus) AE3 Obv: DNFLCLCONSTANTIVSNOBCAES - Bare head, draped and cuirassed bust right; О” behind head. Rev: FELTEMPREPARATIO Exe: SMK - Soldier spearing falling horseman. RIC 107 (Cyzicus) AE3 Obv: DNCONSTANTIVSNOBCS - Bare-headed, draped and cuirassed bust right. Rev: FELTEMPREPARATIO Exe: SMK - Soldier spearing falling horseman. $3 9/20/03. 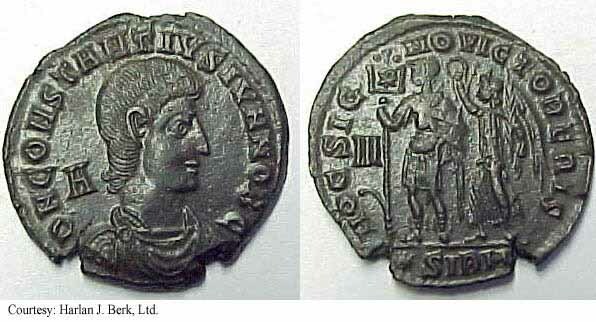 RIC 117 (Constantinople), LRBC 2038 AE3 Obv: DNFLCLCONSTANTIVSNOBCAES - Bare-headed, draped and cuirassed bust right. Rev: FELTEMPREPARATIO Exe: вЂўSвЂў/ /CONS - Soldier spearing a falling horseman. $7 2/14/02. RIC 120 (Constantinople) AE3 Obv: DNFLCLCONSTANTIVSNOBCAES - Bare-headed, draped and cuirassed bust right. Rev: FELTEMPREPARATIO Exe: CONS - Soldier spearing falling horseman. 351-354 (Constantinopolis). 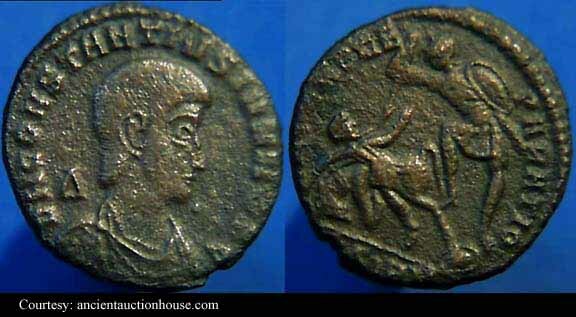 RIC 122 (Constantinople), LRBC 2044 AE3 Obv: DNFLCLCONSTANTIVSNOBCAES - Bare-headed, draped and cuirassed bust right. Rev: FELTEMPREPARATIO Exe: вЂў/CONS - Soldier spearing falling horseman. 351-354 (Constantinopolis). 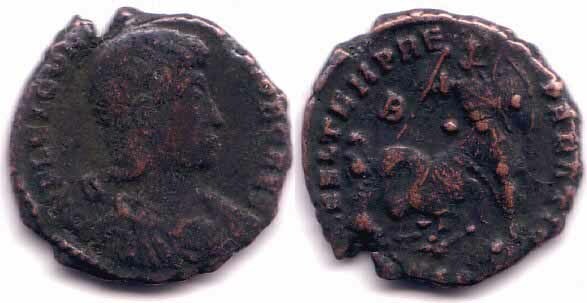 RIC 124 (Constantinople), LRBC 2047 AE3 Obv: DNFLCLCONSTANTIVSNOBCAES - Bare-headed, draped and cuirassed bust right. Rev: FELTEMPREPARATIO Exe: X/вЂў/CONS - Soldier spearing falling horseman. 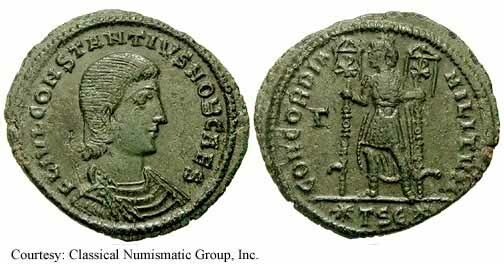 351-354 (Constantinopolis). $65 8/29/03. 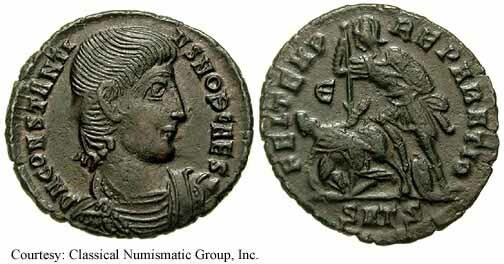 RIC 181 (Constantinople) AE3 Obv: DNFLCLCONSTANTIVSNOBCAES - Bare-headed, draped bust right; О” behind head. Rev: FELTEMPREPARATIO Exe: TS - Soldier spearing falling horseman. 351-354 (Thessalonica). $3 12/24/02. RIC 186 (VIII, Thessalonica), LRBC 1680 AE3 Obv: DNCONSTANTIVSNOBCAES - Bare-headed, draped and cuirassed bust right. Rev: FELTEMPREPARATIO Exe: вЂўSвЂў/TSв€€ - Soldier spearing falling horseman. RIC 190 (Thessalonica), LRBC 1682 AE2 Obv: DNCONSTANTIVSNOBCAES - Bare-headed, draped and cuirassed bust right. Rev: FELTEMPREPARATIO Exe: /SMTS - Soldier spearing fallen horseman. 351-354 (Thessalonica). 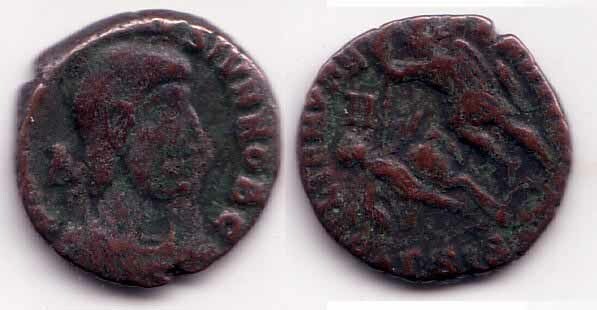 RIC 193 (Aquileia), LRBC 924 AE3 Obv: DNCONSTANTIVSIVNNOBC - Bare-headed, draped and cuirassed bust right; A behind bust. Rev: FELTEMPREPARATIO Exe: LXXII/S/AQ - Soldier spearing falling horseman. 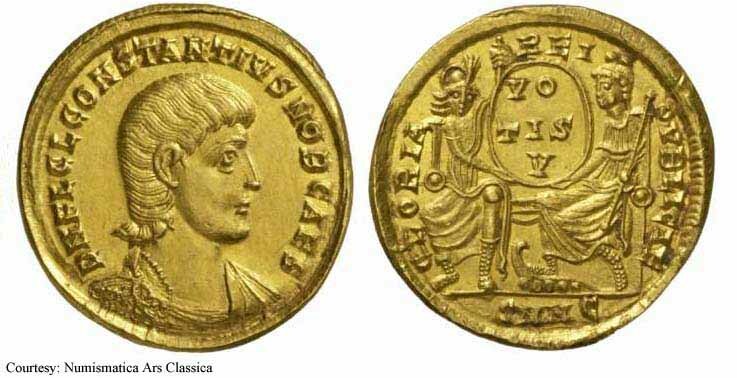 351-354 (Aquileia). $65 8/29/03. 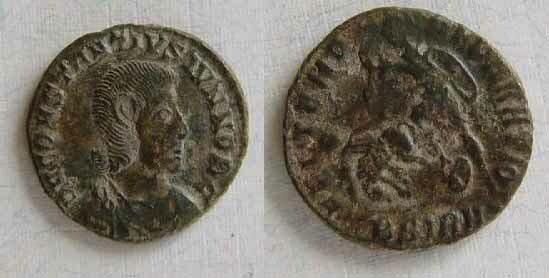 RIC 258 (VIII, Rome), LRBC 663 AE3 Obv: DNFLCLCONSTANTIVSNOBCAES - Bare head, draped and cuirassed bust right; 'B' behind bust. Rev: FELTEMPREPARATIO Exe: О“/R - Soldier spearing falling horseman. RIC 284 (Rome) AE3 Obv: DNCONSTANTIVSNOBCAES - Bare-headed, draped and cuirassed bust right. Rev: FELTEMPREPARATIO Exe: R - Soldier spearing falling horseman. 351-354 (Rome). 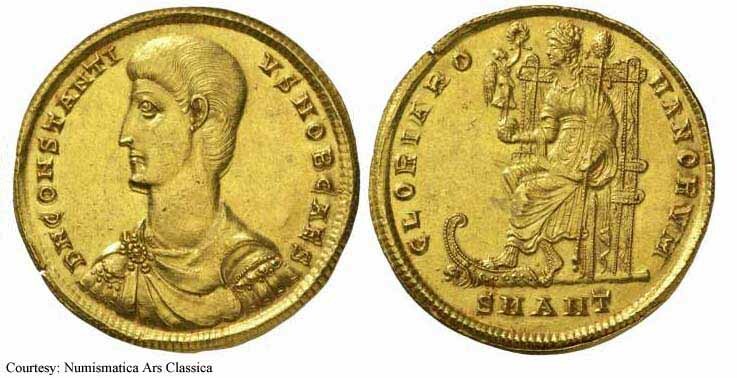 RIC 308 (VIII, Siscia) AE3 Obv: DNCONSTANTIVSIVNNOBC - Bare-headed, draped and cuirassed bust right; 'A' behind bust. 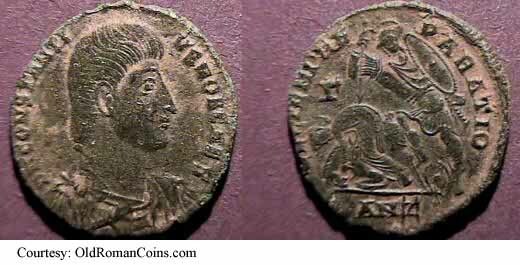 Rev: CONCORDIAMILITVM Exe: SISвЂў - Constantius Gallus standing, facing, holding labarum in each hand. 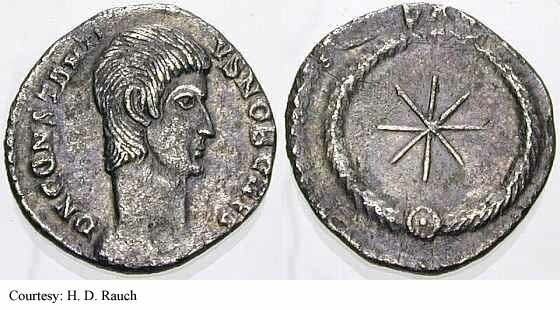 March - August 351 (Siscia). $32 1/30/03. 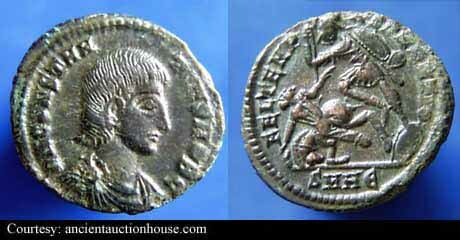 RIC 333 (VIII, Siscia) AE3 Obv: DNCONSTANTIVSIVNNOBC - Bare-headed, draped and cuirassed bust right; "A" behind head. 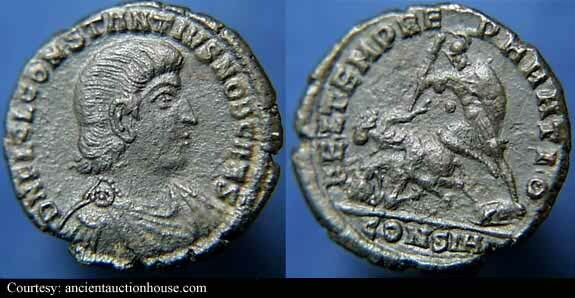 Rev: FELTEMPREPARATIO Exe: III/ SIS - Soldier spearing falling horseman. 351-354 (Siscia). 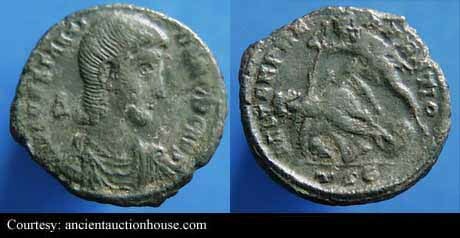 RIC 347 (Siscia) AE3 Obv: DNCONSTANTIVSIVNNOBC - Bare-headed, draped and cuirassed bust right; "A" behind head. 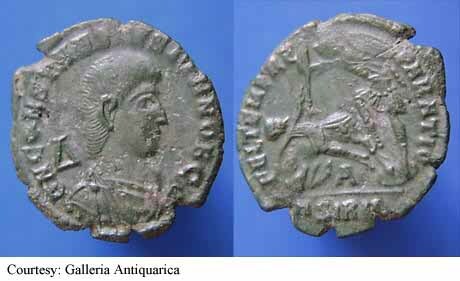 Rev: FELTEMPREPARATIO Exe: I/ SISвЂўSвЂў - Soldier spearing falling horseman. 351-354 (Siscia). RIC 351 (Siscia), LRBC 1219 AE3 Obv: DNCONSTANTIVSIVNNOBC - Bare-headed, draped and cuirassed bust right. Rev: FELTEMPREPARATIO Exe: SIS - Soldier spearing falling horseman. 351-354 (Siscia). RIC 354 (Siscia) AE3 Obv: DNCONSTANTIVSIVNNOBC - Bare-headed, draped and cuirassed bust right. 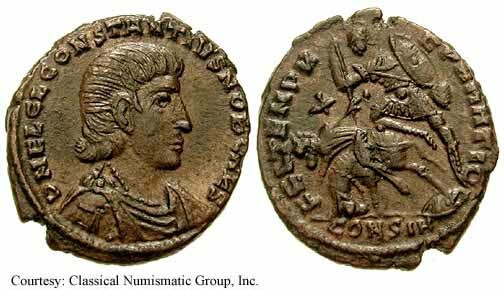 Unlisted AE3 Obv: DNCONSTANTIVSIVNNOBC - Bare-headed, draped and cuirassed bust right. Rev: VICTORIACAESARIS Exe: SIRM - Victory advancing left, holding wreath and palm. 351-354 (Sirmium). $57 7/1/04.